Leave in the 'comments' your blog's name, url address and brief description of your blog's contents. It will be posted at the next updating. Thanxs. 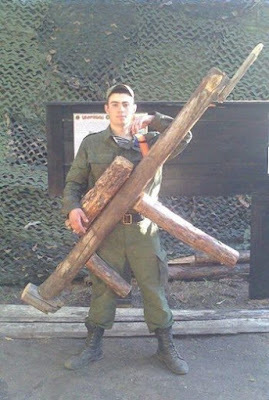 Looks like the Russian Army has quite a comedic form of punishment for its soldiers. If they misbehave, let’s just say they’ll have quite the load to carry around…..
Did not report with weapon – issued a replacement.